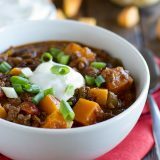 Butternut squash, black beans, and ground beef star in this flavor packed Butternut Squash Chili with Beef. In a small bowl, combine the chili powder, cumin and oregano. Heat the olive oil in a large Dutch oven or soup pot over medium heat. Add half of the spices and stir for 30 seconds. Add in the onion and bell pepper and cook, stirring frequently, until they start to soften, about 5 minutes. Add in the ground beef and the remaining spice mix. Cook, breaking up the meat as it cooks, until the beef is no longer pink. Add in the tomato paste and cook until fragrant, about 30 seconds. Stir in the hot sauce. Add 2 cups of the beef broth, the black beans, diced tomatoes and cornmeal. Stir to combine, then add in the cubed butternut squash. If desired, add more beef broth to thin out the chili. Cover the pot and cook on medium-low for 45 minutes. Remove the lid and cook an addition 15 minutes, or until the butternut squash is tender. Season to taste with salt and pepper.